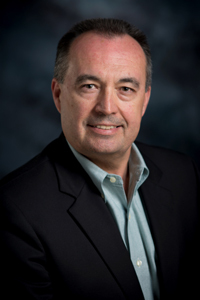 I joined the Waste Treatment and Immobilization Plant (WTP) as the new project director in time to lead some of the most exciting developments we will have achieved in recent years. 2018 marks a significant shift from engineering and construction to startup and commissioning of our facilities. Recently, I shared a project update with the Tri-Cities community in the Tri-City Herald. 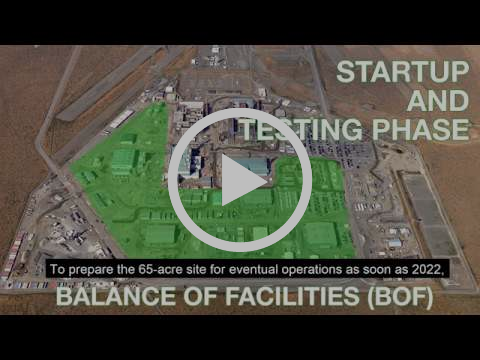 You can read that article on the Vit Plant website at https://www.hanfordvitplant.com/newsroom/in-2018-hanford-vit-plant-continues-on-path-to-startup/. An employee checks electrical equipment in the Low-Activity Waste Facility switchgear building. 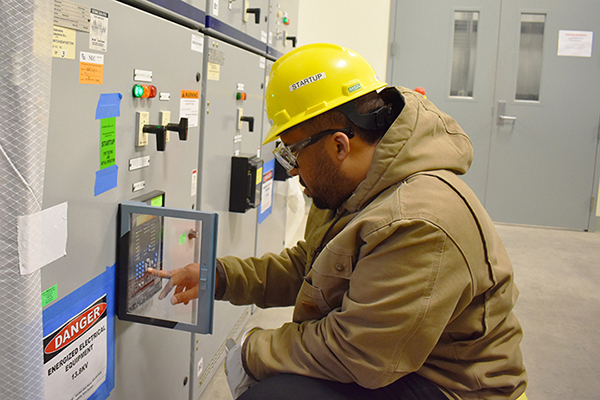 Startup activities at the Hanford Vit Plant received a boost when employees safely brought permanent power to the Low-Activity Waste (LAW) Facility’s switchgear building. Startup employees energized the main LAW switchgear and transformers in mid-March. Electrical power will be sent sequentially to the lower voltage motor control centers and panels throughout the LAW as startup testing of electrical systems occurs over the next several months. Read more about this milestone accomplishment at http://bit.ly/2HXtV7L. Employees place concrete inside formwork and around reinforcing steel during structural concrete wall placements for an effluent management facility at the Hanford Vit Plant. Workers at the Hanford Vit Plant have completed the structural concrete foundation and wall placements for an effluent management facility. 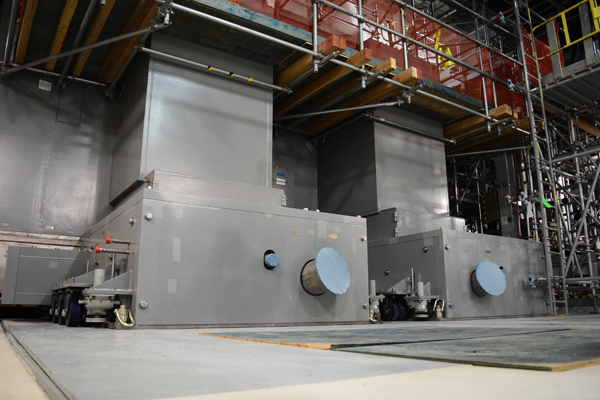 The building will support the Department of Energy’s plans to begin treating radioactive tank waste through its Direct Feed Low-Activity Waste (DFLAW) vitrification approach. Building concrete work began last year and has included more than 990 tons of reinforcing steel bar, 147 tons of embeds, and 7,465 cubic yards of high-strength concrete so far. The effluent management facility works along with robust underground double-walled transfer pipes as part of the Balance of Facilities (BOF) support infrastructure to concentrate secondary effluents generated during treatment of the off-gas from the Low-Activity Waste Facility melter. 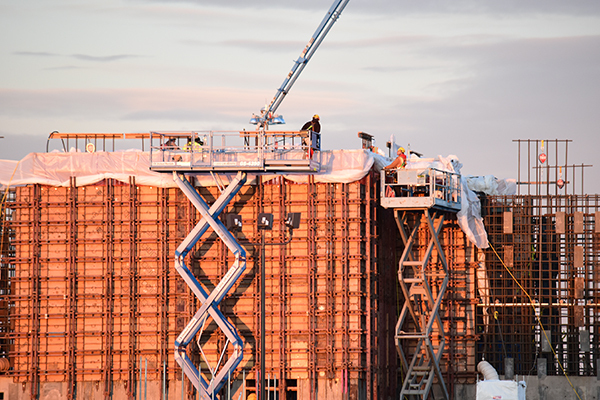 Read more about this important progress at https://www.hanfordvitplant.com/newsroom/concrete-walls-complete-for-vit-plant-support-building/. The 300-ton Low-Activity Waste Facility melters will heat waste and glass-forming materials to 2,100 degrees Fahrenheit during the vitrification process. The Hanford Vit Plant was featured on the front cover of Nuclear Engineering International magazine. The cover story explains how the focus is shifting to startup and commissioning at the first phase of the world’s most complex radioactive waste treatment plant. Published continuously since 1956 with more than 60 years of being an independent nuclear technical journal, Nuclear Engineering International covers all aspects of civil nuclear power generation and its related supply chains globally. Read the full article at http://www.neimagazine.com/features/featurehanfords-melters-6070128/. 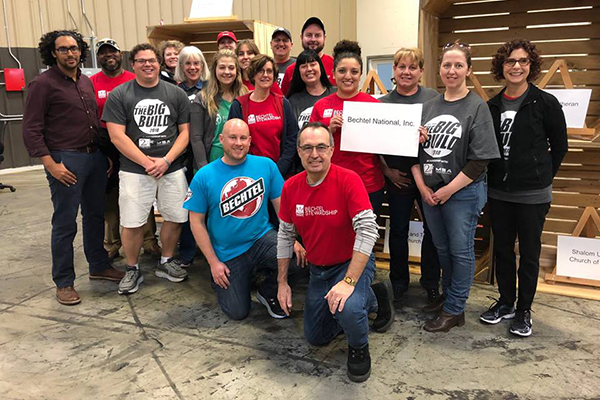 Bechtel National Inc. donated $12,000 as a sustaining partner for the 2017-18 academic year to Second Harvest’s Bite2Go program, which provides food supplies to children in need over the weekend during the school year. Bite2Go kits help ensure school-age kids have nourishment over the weekend and, as a result, are better prepared to learn during the week. Read more about Bechtel's donation and the Bite2Go program at http://bit.ly/2Jisi3R. 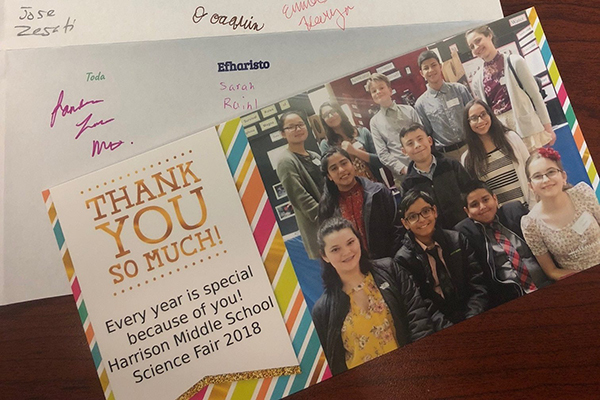 Bechtel supported the Mid-Columbia Science Fair (MCSF) earlier this year and received a thoughtful gesture from some of the students who participated in the fair - great to see these youth engaged in STEM opportunities and learning. The MCSF is the oldest science fair in Washington state and is performed exclusively by volunteers. 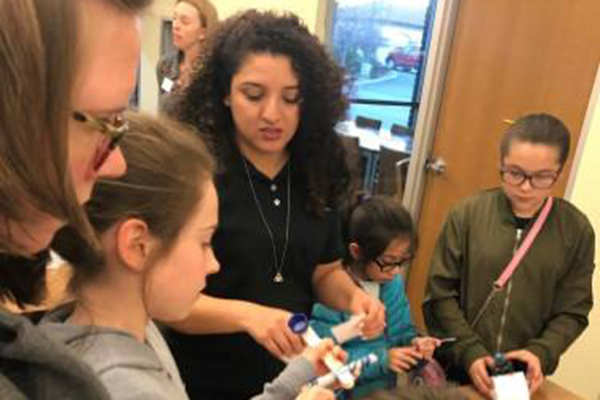 Employees from the Women@Bechtel group at the Vit Plant helped sponsor the STEAM Girls Night Out event to introduce girls to engineering. The event included a showing of Bechtel's Dream Big film, plus hands-on activities and women engineer speakers. The event was co-sponsored by the Eastern Washington Society of Women Engineers and the National Society of Black Engineers. 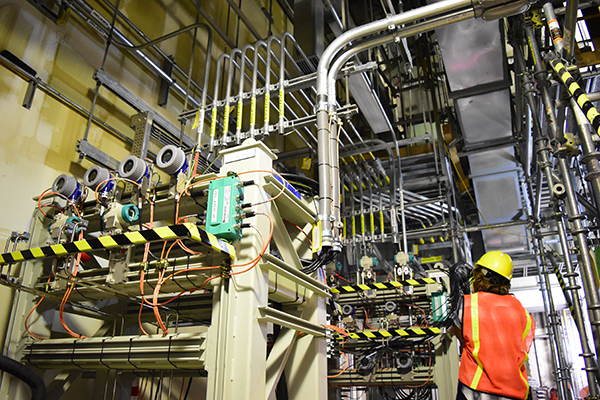 The Low-Activity Waste (LAW) Facility includes more than 1.1 million linear feet of electrical raceway, cables, and wiring. That’s enough combined electrical infrastructure to span 840 laps around an Olympic-sized track or about 210 miles, which is roughly the driving distance from Richland to Seattle. 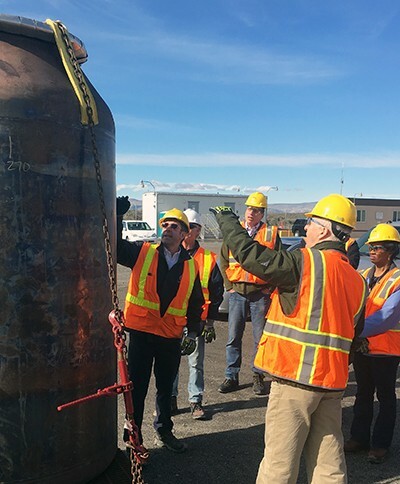 The Waste Treatment Completion Company (WTCC) and Washington River Protection Solutions (WRPS) are involved in an exchange program between the two companies to build greater understanding and collaboration. WRPS operates the Hanford Tank farms and in that role is responsible for feeding tank waste to the Vit Plant for vitrification. WTCC is a subcontractor to Bechtel and is completing construction, startup, and commissioning of the Direct-Feed Low Activity Waste approach. Senior leaders from WRPS toured the Vit Plant jobsite in April, and WTCC leadership will tour the tank farms later this spring. So are we! Follow the Hanford Vit Plant at our new page: www.linkedin.com/company/hanfordvitplant/. Critical startup testing is underway nearly every day in the Low-Activity Waste Facility, Analytical Laboratory, and utility systems needed to support future plant operations. Startup verifies systems are complete and in safe, working order. Learn more about the startup and testing phase of the project in a video at https://youtu.be/HBpH7CvZa7Q. Copyright © April 2018 Bechtel National, Inc., All rights reserved.